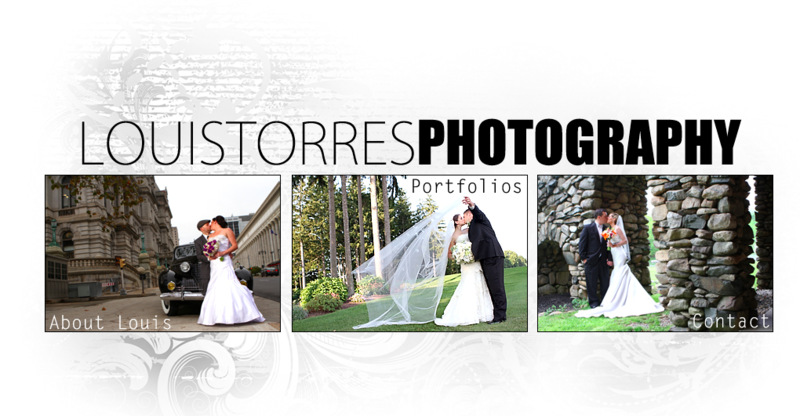 Wedding photography is a business like any other. The rewards go to those who are focussed, professional and work hard. Much the information in this article is based on listening an impressive podcast “For Wedding Photographers by Louis Torres. The great thing about Louis is that he is a real live breathing walking talking practicioner. He bases his advice on his own hard work and experience. Many of my Polish readers are not so aware of the wonderful world of English language podcasting (there just aren’t enough listeners in non-global languages but English language podcasting is full of gems). Louis has been a photographer for 26 years and can charge US$4000-6000 for a wedding package, although is ready to reduce the cost by scaling back the package. You have to listen to the podcast to understand how much effort he puts in to doing his job well. There are 300 episodes with more than 80 hours of content since 2009. Louis tell photographers that they must not be lazy, should do their own research. He is tough and blunt, which makes each short episode all the more useful. For those who are serious about being successful – there will be valuable lessons. If someone already regards themselves as a full fledged professional, then this podcast can even be a check list. It will be reassuring to hear someone at the top of the game in a far off rich country is doing the same things as they are. I am sure everyone will learn something. Louis argues that anyone can and will become an expert at finding anything they’d like to learn by doing research using Google and that the difference between an amateur and a professional photographer is the way he or she markets themselves. Some of his recommendations are just common sense and obvious, but important. – don’t just be punctual, be early. Get to your venue an hour before you are due. Park, and wait, walk in exactly when you are expected. You can read a book, even listen to his podcast. It leaves you time for a flat tyre, transport delays. – don’t charge for a wedding – if you are first timer. “only” $500-1000 is way too much to charge if you are inexperienced. His advice for those who are getting started: Do you homework, research, prepare, practice, get the right equipment, and then do weddings for free for family, friends or people who don’t have a budget, Do your best, but don’t promise to be something you are not. Build your portfolio so that you can base first paid offers on experience and references. Here are some of his tips and ideas if you are already photographing weddings. Focus on your relationship with the happy couple. Of course they want someone professional, but also friendly, nice, respectful and funny. This starts from way before the wedding, from first contact, maybe at Bridal Shows, to discussions and feedback about the plan for the day, to the day itself, post wedding communications and delivery of photos in whatever format has been agreed. The photographer’s experience should lead to advising clients to take the right decisions. They don’t have the experience, the photographer does. Get those shots done. On the day, the couple may want the photographer to wait and not take photos at particular moments, but Louis advises that the photographer should take the photos anyway. The situation you want to record may never arise again, a key family person may be missing, leave early, No one will remember that you were told to wait. Get the shots when you can. Show some photos on the day itself During the wedding, use meal breaks to process and post some photos on social media like Facebook pages. Have a stand and a big monitor/screen where you can show some of the photos in an elegant slideshow. Bring more down to the party in the evening. The couple, their family and guests will love to see the photos right away, will be impressed by your speed and professionalism. Each wedding may have couples who are engaged, who are very likely to ask you for a business card. You will pick up more clients. There are numerous other episodes covering issues like how important it is to focus, time management, tools for processing, editing and distributing photos, contracts, deposit payments. I have no doubt that if I had time to listen to more I would know much more. You can learn about important industry events, his recommended vendors of complementary products and technology tools., If you want to learn about wedding photography this podcast is a great place to start. You get the wisdom and experience of a successful straight talking American professional. As Simon Sinek TED talks fan knows, the most important question is Why. Louis takes the time to answer that too. 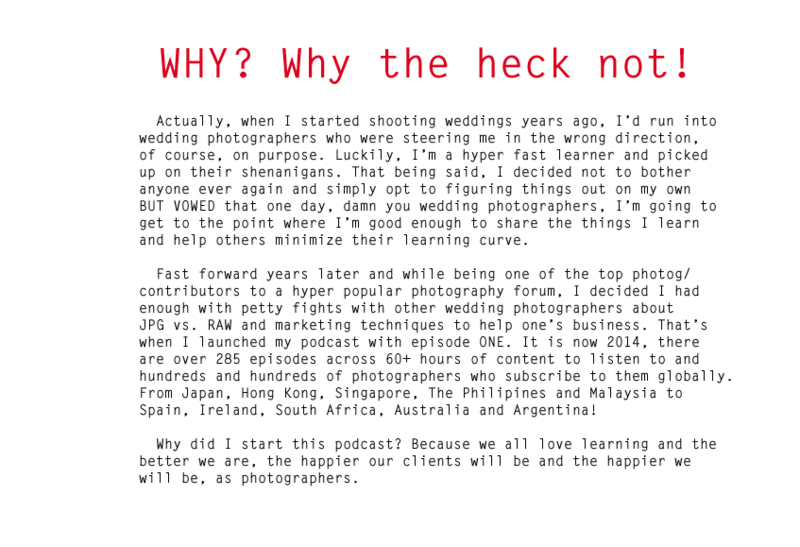 There are lessons in this podcast and hopefully this blog post – for a listener who knows nothing about photography, and doesn’t want to be a wedding photographer too.